Elections have always been the hope of the nations and the voice of the people. It is when we choose the right people whom we can rely on to lead the country and uplift the citizen's conditions from economic and political slavery. But elections are always tinted with violence and political unrest. Everyone has a role to play to safeguard peace and prevent violence from happening. 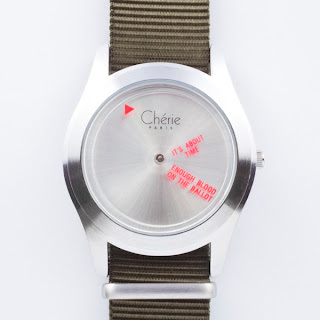 Cherie Paris watches urges every citizen to say "No!" to electoral violence. We have to be vigilant in any activity that will disrupt the electoral process. Wawi Navarroza, an award-winning photographer and visual artist was commissioned to create a photographic tableau which is titled, Not Today. "It is a wake-up call for the Filipino people. The role of the tableau is to shock them and impart how grave the situation is, while the 'Peace' watch is meant to be worn as a constant reminder for our fight against violence and bloodshed," explains Linfred Yap, the managing director of Urban Time. It also admonishes us that real democracy does not have to be violent and dirty, that peace is still achievable if we are united. Last April 20, 2010, the photographic tableau was unveiled in a press launch at the Events Area in SM North Edsa Annex, hosted by RJ Ledesma, the editor-in-chief of UNO Magazine. Deaths due to political violence happen very so often, even not election-related. Navarroza shows in her work a scene that is very similar to the Ampatuan Massacre in Maguindanao that devastated the whole country on November 23, 2009, killing innocent people including a great number from the media. "I got interested in recreating a shared pathos, a familiar disturbing image as a way of addressing the problems," remarks Wawi. Her work is also inspired by Spanish painter Francisco Goya's cathartic painting, The Third of May 1808, completed in 1814, which is now exhibited at Museo del Prado in Madrid. The painting commemorates the Spanish resistance to Napoleon's armies during the occupation of 1808 which also served as a strong visual statement against political violence. The photographic tableau measures 50 by 60 feet billboard that can be seen in front of EDSA Central. Navarroza combined the elements of the real journalistic photos and Goya's masterpiece to recreate what could have taken place at the site (or sight) of a political assassination or murder. "The work aims to destablize our usual reception of images in order for us to remember and rethink how images shape our ideas and opinions in a massive insidious way. I've decentralized the meaning in this picture by depicting reality mirrored as fiction," illustrates Wawi. When asked how he would describe "time," Yap circumscribes, "Time is all about change, fluidity. Time is never constant." This partnership of Urban Time and Wawi Navarroza is an advocacy project that gives hope to every Filipino that Not Today will there be violence, Not Today will there be bloodshed. A limited-edition Cherie Paris watch has been designed by the artist to remind us to make an active stand, that Today will always be a conscious warning to fight against any form of criminal injustices, dishonesty and brutality. The "Peace" watch features a short hand that reads "IT'S ABOUT TIME" and a long hand that asserts "ENOUGH BLOOD ON THE BALLOT." Get up, Stand up, Speak up. Sign up to make a stand and shout "Enough blood on the ballot" thru http://itsabouttime.com.ph. Speak up for peace and democracy. Petitioners will also receive a free gift from Cherie Paris, redeemable at all Urban Time outlets nationwide.